Basic Enhancements: At launch, the Nook was buggy and slow. B&N has been working on this, and the latest update includes even more improvements, such as faster page turns. Also, if you're at a Wi-Fi hotspot where AT&T's 3G won't cut it (say, an airplane), a Web browser now makes it possible to authenticate. Browser, With a Catch: The Nook now has a basic Web browser, in beta, which should at least allow people to read some daily news and blogs. But as one commenter on Engadget noted, it's Wi-Fi only. Also, I'd like to see either the Kindle or the Nook treat Web browsing with respect and offer something robust, as we've seen in Spring Design's Alex. 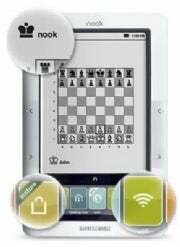 Games: Thumbs up to B&N for adding two obvious time-wasters, Chess and Sudoku, to the Nook. Amazon will likely add similar functionality with its app store later this year, but for now the Nook has the upper hand. I wonder when we'll see crossword puzzles. Read In Store: What initially seems like a cool feature is actually sort of silly when you think about it. Barnes & Noble will now let Nook owners read books they don't own, for free, using the store's Wi-Fi -- for a maximum of one hour per day. Why the restrictions when you're surrounded by books that don't enforce time limits? Menu Tweaks: With all the new features available, B&N has expanded the Nook's menu beyond a static screen. You can now drag a finger to scroll through the Nook's color touch screen, revealing the following new options: Games, Web, Wi-Fi and Audio. Yes, the music player has been given greater prominence.